Hi guys. I bought this audio system 2 days ago and I have this same issues like you. I checked my software and I discovered that my soundbar has firmware number 79. How to update software to 103? Lee, I'd like to mention that you have been very helpful and patient, not sure I would have and have been here at CP for years. I connected my soundbar to router by wire but after 24 h still nothing my firmware number is 79. I was so desperate and I installed Google Home app. on my Iphone and I switched on automatic update but still nothing :/Maybe i need to waiting little longer? Is it true that this new software can resolve issue? Try using the Google home app, as LeeSoFL mentioned above. How long I need to wait for this update? System updating automatically after I connect soundbar to internet? In most cases it happens overnight. Do you have any issue with rear speakers after this update? Found this post after my Max SR system started with rear speaker chirping a few weeks back - mainly on the left, but now on both after I re-paired everything. On firmware 103. I have had the speakers since they came out last December, and was generally happy until the past few weeks - seems like for others they have improved but for me they've gotten a lot worse. I'm running this with ethernet cable plugged and have tried repositioning sub, etc - nothing's helped. Primarily using this with Shield TV and PS4 - I'm thinking this might be a Dolby/DTS decoding issue. When I set the PS4 to force dolby, the chirps appear on upmixed/non-dolby content, but netflix or other proper dolby 5.1 content is flawless. When I set the PS4 to output Linear PCM, I don't get chirps, but I lose the 5.1 options in Netflix since the soundbar can't handle DD+. At this point I'm really regretting my decision to ditch my wired surround setup.. hoping there is a fix that doesn't require my constantly switching output formats on the PS4 or Shield TV. Also open to further troubleshooting suggestions! My system updated to 103 version and I'm disappointed. I'm hearing strange voice from my rear speakers. Today I need to return this system to seller and I have to choose something else. I have the same problem and maybe a solution. I've reset the max sr and reconnected the speakers. But I did not connect the system to Google Home this time and so far all the speakers are running without problems, so please test it for feedback. Updated to version 103 earlier & so far no popping from rear speakers & crackling from sub much improved. However I now have a noticeable lack of bass which is really disappointing (all speakers synched). Played scences from about half a dozen Blu-rays I’m familiar with & the sound is no where as good as the audio pre update or when I purchased the sound bar & demo’d In store. Very very frustrating Polk!! casper868 - Pre v.103 update I tried your suggestion which was a big improvement over v.91. I did experience some interference on the rears but no loud popping. Still heard crackling through the sub but again not as bad as later software versions. Blu-ray audio playback was much more immersive than v.103 with good bass. The same problem. After the V103 update, the bass is incomplete. Is it possible to downgrade it? lalacko - not sure if it is possible to roll back to a specific firmware version. What I did was uninstall google my home app (so it wouldn’t automatically update) & then reset the soundbar to the factory default version using the reset button at rear of soundbar. You will then probably need to re-synch the sub & rears. I have left mine on V.103 & maxed up the bass which has helped but in my opinion & others is not as good as the sound when purchased but at least my rears aren’t popping making people jump! The sub crackling hasn’t completely gone away but is better but at a lose to the bass. Feel a bit ripped off to be honest as the sound is not as good as when purchased! Same problem here. Crazy loud chirping from surrounds, and occasional pops from subwoofer. So far I've tried a factory reset (x3), eliminating my wireless router from the equation, disconnecting from Google Home altogether. As far as I can tell, the firmware remains at v.103, so I'm also wondering if a rollback would solve the problems. I don't remember having these issues my first few weeks with it. As of now I keep the surrounds muted while not viewing 5.1 content (so my wife won't feel the need to unplug them after being startled). It's definitely been a pain. I'm reaching out to Polk to see about a repair or exchange. Here is a detailed list of the issues I've been having, in case there are any noticable differences or striking similarities to your own Magnifi Max SR experience. 1. Sometimes when PS4 adjusts resolution, soundbar seems to get confused by the signal and refuses to relay to the TV. One time it did not come back on, and the indicator light turned to red. Thanks everybody, for posting your experience. I hope Polk can figure this out for us. Let me send this to a Polk engineer. Please send the customer this procedure. This will confirm that the correct firmware is on the surround speakers. I bought Magnifi a few days ago. I read these comments about popping and crackling, I read Aro comments too, but I thought, that with the 103 version is everything good for now. From the first day, when the package was delivered, I was very happy with Magnifi. It has got Chromecast, the design od Magnifi is beautiful, it has all of the cables included. I thought: wonderful! Everything is in these small beautiful machine. The price is good too. I began to listen the sounds going out from the speakers. The Magnifi was mounted to wifi and google home. The Google app shows version 103. Firstly - I didn't notice the lack of bass fot the whole time. Unfortunately, I heard a few moments in films, music etc., when the subwoofer "popps" quietly. It is only heard, when standing closely to the subwoofer. Today the left surround speaker started to "sing like a bird" for a short moment - 3-5 seconds and it has vanished. Fortunately, it didn't repeat. It was the same moment, when the subwoofer popped too. If this problem wouldn't appear, the sound would be really amazing, spectacular and for me better, than the other soundbars. Thanks for the reply, Ken. I hardwired my Magnifi Max via Ethernet and followed these instructions. It seems that everything is up to date. Playback of 5.1 content sounds fine, but during other content and while the SR1 speakers are idle, I am still having the same issues before. Same issues in any scenario. I’m wondering why the surrounds don’t just automatically mute when the device doesn’t sense 5.1 content. It seems like that would make sense. I started using Music Mode in those situations to avoid my constant feelings of buyers remorse. That seems to work fine. Any further assistance is greatly appreciated. 1) The rears continue to work after turning off the soundbar. If you bring rears to your ear, you hear a quiet white noise. From time to time they are heard clicks and pops. 2) The soundbar is in direct line of sight from the rears at a distance of 4m. 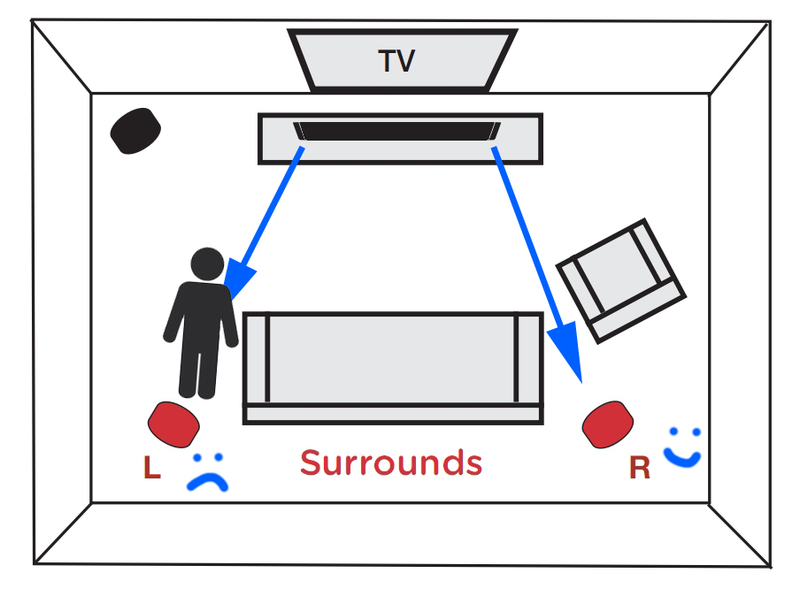 If you stand up between the soundbar and the rear speaker during playback, shielding it with your body, you will clearly hear how the rear speaker loses the signal. 1) Why the rears do not turn off with the soundbar, but continue to send a signal to the speaker? Sorry there's a problem, send an email to: [email protected] for assistance. I’ve got new details, after the last two weeks of observation. 1) Popping most frequently happens when the source stops send the sound signal to the rears. For example, when I press a pause button while a movie is playing, after the next 15-60 seconds or on silent moments in movie the popping sound might be heard. 2) Popping highly probable depends on the fact if something is placed between the soundbar and the rears. To make situation worse might be enough to place a chair between them. As a result, on dynamic movies scenes a clicking sound or rattle might be heard from the rears. 3) I think, the main problem in the low level of the signal from the soundbar. Because, if I stay very close to the one of the rears I can almost fully disconnect it (it stops playing completely). So main question if there any possible solution to increase the signal power from the soundbar, at least to cover fully the room which size is less than 20 square meters? It might help sometimes when the sound bar is placed close enough to the rears and all things between them, for example, chairs are removed. During this weekend I’ve done an experiment. The rears were placed from the soundbar at the distance of 1, 2 and 3 meters. Each time I couldn’t cause any sound distortion via placing something or someone between the soundbar and the rears. First problems occur at the distance of 5 meters and might depends from the room configuration/shape. Personally, little crackles cause much more frustration than popping (which appears only on pauses or silent moments). On the advice from KennethSwauger, I had an email conversation with Ken.Carter about this problem. Unfortunately, seems there is no solution or workaround. For me it’s obvious that the main reason of the problem is a critically low transmitter power. I think, only Polk engineers are able to give an answer if it’s true. The crackles might be caused by the lost packages from soundbar which incorrectly processed by the rears. As I can see, others are struggling with the same problem, so the problem not only with my device. We can only hope, that Polk might take into account this information and would try to fix it in the next firmware version. 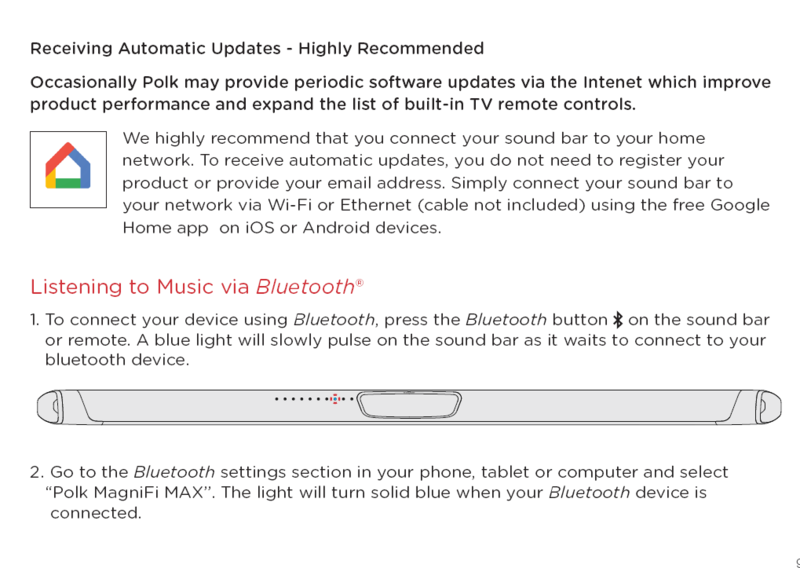 For now I will just move the rears as closer as possible to the soundbar while I hate Polk’s engineers for this issue.